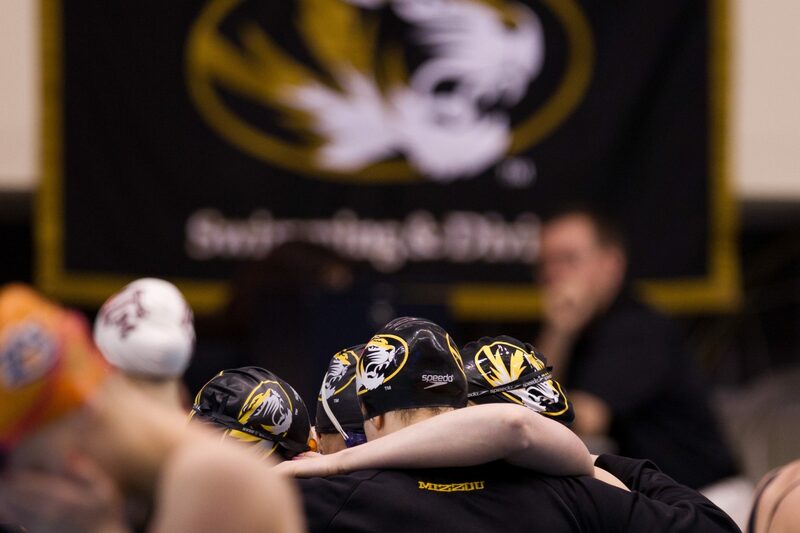 Missouri’s 200 free relay teams can both pack their bags for the NCAA championship meets after each of the relays made NCAA qualifying standards. The women’s 400 medley relay punched their ticket in record breaking fashion. The men’s 200 freestyle relay finished well under the standard of 1:18.02, touching at 1:17.64. 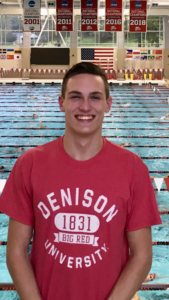 All four swimmers slit under 19.6, and three of them, Michael Chadwick (19.31), Sam Tierney (19.32), and Christian Aragona (19.43), were under 19.5. Matthew Margritier was 19.58 on the leadoff leg for the Tigers. Mizzou took 2.92 seconds off it’s seed time. The foursome also set a school record, bettering the old record of 1:18.20. UNLV’s A relay made an NCAA provisional cut with their second place finish of 1:18.52. Dillon Virva lead off with a 19.77, Tom Paco-Pedroni split 19.51, Or Sabatier split 19.39, and Henrique Machado split 19.85. UNLV shaved 3.37 seconds from their seed time to beat seconded seeded, Division II powerhouse Drury, by over a second. Drury’s relay finished third in 1:19.63. The women’s relay was just as impressive, and also dropped 2.92 seconds to hit the qualifying time. finishing in 1:29.36. The Tigers were led by Dani Barbiea, the second leg swimmer, who split 21.76. Rachel Hayden led off with a 22.85, Hannah Stevens swam 22.53 in the third leg, and Anna Patterson anchored in 22.22. The Drury women were second in 1:31.64. Matthew Margritier of Mizzou, who was seeded first with a 19.41, did not have enough in the tank to take down Dillon Virva of UNLV in the 50 free, however, as Virva Narrowly out touched Margritier in the 50 freestyle, 19.56 to 19.59. Drury’s Daniel Rzadkowski was third with a 19.84. UNLV’s Or Sabatier was fourth with 19.90. Mizzou did win the women’s 50 free. Rachely Hayden’s third 50 freestyle of the day was her fastest. She touched first in 22.67. Not far behind was the Drury pair of Wai Ting Yu and Wen Xu, who were second and third in 22.74 and 22.83, respectively. The other exciting relays tonight were just as exciting. The 400 medley relay was not much of a race, but that didn’t make it any less exciting for the Mizzou women. For starters, the women dropped almost eight seconds in from their seed time, improving to a 3:32.60. Next, Hannah Stevens, a freshman, swam a 52.04 in the backstroke leg, just .02 seconds of the school record. The relay time also represents a school record and another NCAA Qualifying time, both of which the Tigers were easily under. They beat the old record of 3:33.79, set just last season. Mizzou’s A and B relays finished one and two in this event, although the B relay narrowly out touched the UNLV A relay. Carter Griffin, Sam Tierney, Andrew Sansoucie, and Michael Chadwick finished in 3:10.11. Chadwick brought the relay home with a 42.10 anchor leg. Sansoucie was 47.61 on the fly leg. The Tiger B relay was ahead 1:41.06 to 1:42.25 over UNLV’s B relay. Mizzou even had the lead, 2:27.77 to 2:29.72 going into the freestyle, but Tom Paco-Predroni could not run down Levi Hanks, despite a 42.47 split. In the end, the Tiger B relay narrowly edged out UNLV, 3:12.15 to 312.19 to finish action for the night. Gabbie Stecker scored a big win for the Illini in the 500, dropping almost a full four seconds from her prelims time. 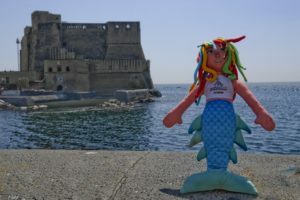 She went 4:46.99 in finals after a 4:50.96 in the morning. Kira Zubar of Mizzou looked like the clear favorite after prelims, having gone 4:48.95 for the number one seed, but added time in the afternoon to finish in 4:49.20. Allie Reynolds was third for Drury with a 4:51.54. The Mizzou men, seeded 1-2-3 in the 500 freestyle after prelims, finished in the same way in finals. Eegan Groome dropped a full two seconds from his time in the prelims to score the victory in 4:19.56. Andrew Phillips was second in 4:24.64, followed by Martin Wallace in 4:26.75. Mizzou also scored a fifth place finish from Ryan Baker in 4:27.19, a seventh place finish from Levi Hanks, and an eighth place finish from Nick Davis, who gained almost seven seconds from his prelims time, finishing in 4:34.05. Mizzou got another 1-2-3 finish in the women’s 100 fly. Dani Barbiea swam a 51.51 in prelims, an NCAA A cut, and added time in the finals, finishing in 51.97 but still winning the event handily over her teammates. Erin Metzger-Seymour was second in 53.74. Hannah Stevens was third in 54.40, a gain of about half a second from the prelims. Andrew Marsh of West Virginia scored a victory in the 100 fly after jumping from a fourth place seed from prelims to win the event. Marsh won in 47.49. Andrew Sansoucie was second for Mizzou in 47.62, followed by Stanislav Kuzmin and Samuel Olson of Drury in 47.74 and 48.45 respectively. Missouri and FIU dominated the 200 IM. Katherine Ross of Mizzou won the event by a full second over her teammate, Abby Duncan, 1:58.27 to 1:59.27, respectively. Ross’ time puts her at second all time for the Tigers, and she is only a sophomore. Duncan’s time ranks fourth in school history. Johanna Gustafsdottir was third for FIU, finishing in 1:59.67, dropping almost two seconds from her prelims performance. Her teammate Karin Tomeckova was 2:00.91 for fifth place. Silvia Scalia was seventh for FIU in 2:03.80. Sharli Brady was fourth for the Tigers in 1:59.67, Ellie Suek was sixth in 2:01.70, and Dani Spradlin was 2:04.20. The Men’s half of the IM featured a 1-2-3-4 finish for the Tigers. Mack Darragh led the way with a 1:45.50. Igor Kozlovskij dropped over a second and a half from the morning session on the way to a second place finish. Kozlovski was 1:45.60 in what was a two horse race between the teammates. Austin Fish was 1:47.68 for Mizzou for third. Daniel Graviss was fourth for Mizzou, touching in 1:48.24. Drury’s Kacper Pelczynski was third in 1:48.54.